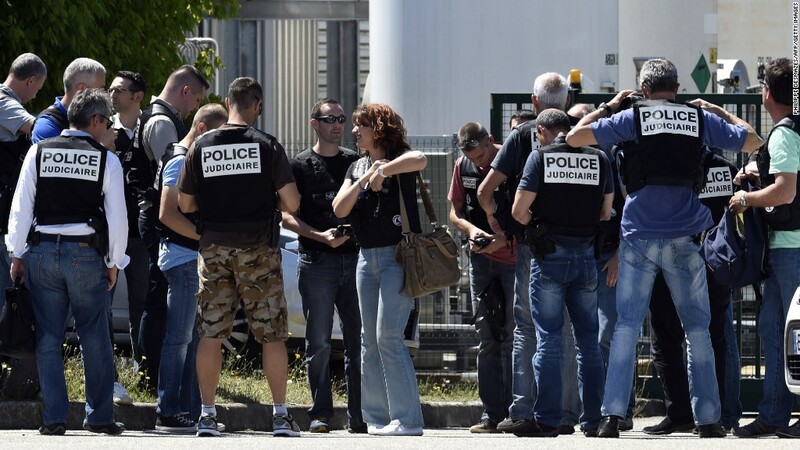 A gruesome terror attack in France on Friday took place at a factory owned by American firm Air Products & Chemicals. French President Francois Hollande said a car was crashed into a building, and a decapitated body and severed head were found with a message. The attack also left two people injured. Air Products confirmed an attack took place at its facility in L'Isle-d'Abeau, near Lyon. "We are deeply saddened by the loss of life and want to express our sympathies to the family of the victim of this unspeakable tragedy," the company said in a statement. All employees working at the site had been evacuated, and the site was now secure. Air Products said it was increasing security at locations around the world as a precautionary measure. Air Products (APD) sells specialty gas and chemical products to a range of companies in the energy, electronics and manufacturing industries. The Fortune 500 company is headquartered in Allentown, Pennsylvania, but has operations in more than 50 countries and employs over 20,000 people. It has a market capitalization of $31 billion. Leonard Parker Pool, the son of a boiler maker, founded Air Products in 1940 in Detroit. His big idea was to produce industrial gases at customers' sites, saving on hefty transportation costs and undercutting the competition. Business took off during World War II, when the company designed and manufactured mobile oxygen generators for the military to use during high-altitude flights. Billionaire Bill Ackman's Pershing Square hedge fund is the largest single shareholder with a stake of 9.6%, according to FactSet data.